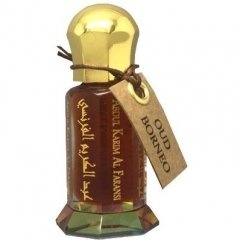 Oud Borneo is a perfume by Abdul Karim Al Faransi for men. The release year is unknown. The scent is smoky-fruity. It is still in production. Very dry oud fragrance (no barnyard note at all in this one, very safe), very woody with a beautiful smoky note. There's a bit of vanilla and patchouly that give it a very slightly sweet boozy feel to it. Linear and beautiful, smells very natural and soft, this is more a personal experience. A still only have a sample, but I find this one beautiful for blending, I mean, until now it blends perfectly with everything, giving it a woody smoky feel to it (btw when I got it it was named oud kalimatan, then it disappeared from the store, when I asked Abdul Karim he said the name changed to Oud Borneo, so I'm pretty sure Oud Kalimatan and Oud Borneo are the same, still need to check it again when I order it). Write the first Review for Oud Borneo!